Colour photograph of the ITT Cannon Electric Canada facility in Whitby. ITT Cannon Electric Canada was located on Cannon Court, off Consumers Drive, north of Highway 401. 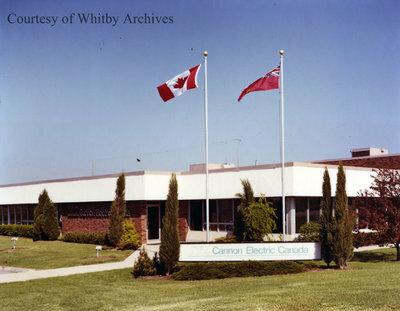 The American company relocated its site from North York to Whitby in 1973. ITT Cannon Electric Canada, ca. 1983, photographer unknown. Whitby Archives photograph D2016_004_008.